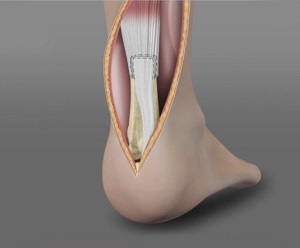 The Achilles tendon is a thick fibrous cord located behind the ankle which connects the calf muscle to the heel bone. The tendon is used any time you walk, run, or jump. When the tendon becomes weak, it becomes more likely for it to experience an injury. This overuse and weakness is called Achilles tendonitis. Achilles tendon tears or ruptures are common injuries for middle aged athletes who are involved in sports consisting or running, jumping, or pivoting. Other sports which may lead to torn Achilles or ruptured Achilles include tennis, badminton, soccer, or racquetball. When Achilles tendonitis leads to a torn Achilles people are likely to experience severe pain in the back of the leg, in addition to swelling, stiffness, and difficulty standing. Pushing off with the injured leg will be also be difficult. Achilles heel pain can range from moderate to severe depending on the injury and attempted use of the affected leg. Often when the Achilles injury is a tear, people will hear a popping or snapping noise behind the ankle. Depending on the tear, it is also possible to feel a gap or depression where the Achilles was previously. During the examination, Dr. Patel will ask the cause of the injury and will assess the case based on the level of pain and range of movement. If the Achilles tendon is not torn, there will be some range of movement. If the tendon is torn, there will be very limited or no range of movement. Further imaging techniques will determine the nature of the injury and the treatment plan required. If the tendon is not torn and surgery is not required, Dr. Patel will recommend wearing a cast or brace to secure the area and allow the tendon to heal fully. Physical therapy will be recommended at the same time to increase strength in the tendon and leg muscles, and return full flexion to the heel. Achilles tendon surgery involves opening the back of the ankle and stitching the torn tendon ends back together. Incision sizes depend on the exact treatment plan recommended by Dr. Patel. Successful surgeries may reduce the chance of re-injury when compared to non-surgical treatment plans but does come with possibility of surgical complications. This may be recommended for people who intend to return to heavy physical labour or athletic activity. Following surgery, patients will have to wear a cast from the toes to the knee to keep the leg safe. In some cases, a nerve block will have been given. In these cases, patients will not have sensation in the affected leg for up to 24 hours after surgery. Between two to six weeks after surgery, patients may advance from their cast to a walking boot. Physical therapy will be recommended at this time to return strength and flexion to the Achilles heel. After six weeks, patients can expect to return to weight bearing activity without a cast or boot. Exact recovery times depend on the specific injury endured and type of treatment plan followed, but most patients can expect to return to normal activity within six months of surgery. What Is Best For Tendonitis Prevention? To prevent tendonitis from occurring, it is recommended that athletes or people involved in heavy physical labour warm up before activity. Routine stretches and exercises to keep the tendon strong and flexible will greatly reduce the chance of injury. If you have experienced Achilles tendonitis in the past, attending physical therapy or utilizing a personal trainer to keep yourself fit. Have any more questions about this tendonitis? If you’re suffering from an injury to your Achilles and need information - Dr. Ronak Patel can help you choose the best option for treatment and recovery. Call or book an online appointment.